As a loyal worker, you win by finding other loyal workers and play work cards to add work to the Canal. As a disloyal worker, you win by finding other disloyal workers and play strike cards to prevent work from being added. The Canal is completed if enough work cards are played. The game starts with each player drawing one worker card, looking at it and giving it to the player to the right. Each player knows the loyalty of one other. The game is played in turns led by the rotating role of the commissar. The commissar selects 3 players; 2 to work on a task and 1 to supervise the task. The workers secretly select one work card or one strike card each. The supervisor then decides whether to supervise one of them. If supervised, the worker must replace the selected card and select the other (opposite) card instead. The commissar shuffles and discloses the cards and add the played work cards (if any) to the Canal. When all players have played the role of the commissar, the game ends. 1.0: First edition, submitted to 18 Card Microgame Contest. There are many ideas that came to live in Gulag©. On this page, I would like to present some of them and explain the reasoning behind them. The semi-hidden information where each player knows one player and is known by another player is a key element of the paranoid gameplay of Gulag. But which player should you know? Should it be a fixed player (based on turn order), a selected player (based on active player selection) or a random player (based on drawing)? First I thought of simply letting each player know the player to the left. However, this would give the commissar an incentive to pick players following him or her in turn, since those are the most known players, giving an imbalanced gameplay where the first players in turn are selected for tasks first while the last players are left out. A simple solution was to let each player know the player to the right. That would engage both the players first in turn (playing the commissar early) and last in turn (being selected for tasks early). In addition, the commissar would not be able to select an indirectly known player (a player known by the player the commissar knows) since this would be the commissar him- or herself. 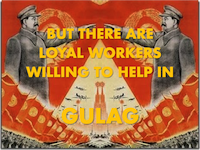 With the left rule, a loyal commissar with a loyal known player would be able to select that player for the supervision and that player's known player for the task. The supervisor would then know the loyalty of the task player and know whether to supervise or not. How about letting the players select whom to know then? Initially, I found the idea intriguing but given the discussion above, I feared that they would select the players after them in turn. In addition, this would add unnecessary downtime before the actual game start. A random selection would be quicker but also add unnecessary complexity to the game as players would not be able to look at the turn order to know who knows whom. 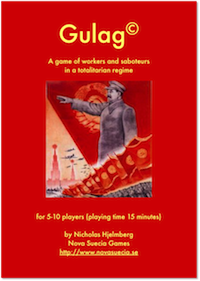 Gulag is not a game about remembering who knows whom (although a good memory helps), it's a game about deducing how players will use their knowledge. What is a fair victory condition in a 2 team game? That one team scores more than the other. But in Gulag, only one team scores (the red) and the teams may be of different sizes. A more suitable victory condition would be for the scoring team to score more than the average expected score (and for the non-scoring team to prevent this). OK, but what is the average score then? The number of turns equal the number of players and in each turn, 2 workers may play task cards. This means that each player will play on average 2 task cards (in a 5 player game, 10 task cards are played and so on). Assuming that each player gets to play according to their loyalty, each red worker will add 2 to the Canal and the average total score will equal twice the number of red workers. If they play more, they win, and if they play less, the black workers win. This is an elegant victory condition that scales automatically since each new player also adds a new turn. The tie-breaking rule of giving the victory to the smallest team is a compensation for the bigger team's advantage in selecting "pure" teams - a team of 3 players or less will never be able to form a team where both the commissar and the 3 selected workers share the same loyalty. The cards may not be revealed and initially the players were not even allowed to speak about them, since I was worried that it would be too easy to find players to trust. If you for example as a commissar select the player you know for a task, couldn't you ask her to use her knowledge to select (or exclude) the second player, quickly breaking down the uncertainty of the game? However, testing showed that although the commissar may trust the player but that player may not trust the commissar and the supervisor may get too many clues to ruin everything... So, the word is free but cannot be trusted.